The Business Roundtable CEO Economic Outlook Index is based on a survey -- conducted quarterly since the fourth quarter of 2002 -- of our member CEOs’ plans for hiring and capital spending, and their expectations for sales, over the next six months. Taking these factors together, the survey signals the direction of the U.S. economy. Washington – The economic outlook among Business Roundtable CEOs remained strong in the third quarter of 2018 according to results of Q3 2018 Business Roundtable CEO Economic Outlook Survey. 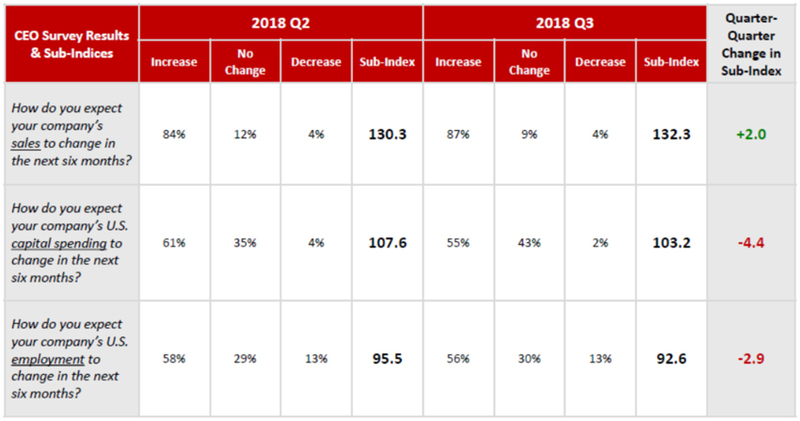 However, the Q3 CEO Economic Outlook Index – a composite of CEO expectations for sales and plans for capital spending and hiring over the next six months – decreased slightly as business leaders experience uncertainty and negative effects from the Administration’s actions on trade. The Q3 2018 CEO Economic Outlook Index was 109.3, a decline of 1.8 points from 111.1 in the second quarter of 2018. At 109.3, the Q3 Index is the fifth-highest in the survey’s 16-year history and well above the historical average of 81.6. This is the seventh straight quarter where the Index has exceeded its historical average, signaling a continued positive direction for the U.S. economy. CEO plans for hiring declined 2.9 points to 92.6 in Q3, the third-highest value for the employment sub-index in the Survey’s history. Plans for capital investment fell 4.4 points to 103.2, the sixth-highest value for the capital spending sub-index in the Survey’s history. Expectations for sales increased to 132.3, up 2 points from the previous quarter and the second-highest value of the sales sub-index since Q2 of 2011. In their fourth estimate of 2018 U.S. GDP growth, CEOs projected 2.8 percent growth for the year, up slightly from their 2.7 percent estimate in the second quarter. Joshua Bolten, Business Roundtable President & CEO, added, “This survey shows how tax reform and regulatory relief continue to bring strength to the economy. Yet, current trade policies and uncertainty about future trade policies are having negative effects, especially on capital investment. Decreases in capital investment not only impact the operations of Business Roundtable companies, less spending on equipment and facilities also squeezes small- and medium-sized suppliers and the millions of Americans they employ. In the Q3 Survey, Roundtable CEOs were asked a special question regarding the effect of U.S. trade policy on capital investment. Nearly two-thirds of responding CEOs said that recently enacted tariffs – along with other changes to trade policy and uncertainty about future trade actions – will have a moderate or significant negative effect on their companies’ capital investment decisions over the next six months. The Business Roundtable CEO Economic Outlook Index — a composite of CEO expectations for sales and plans for capital spending and hiring over the next six months — decreased from 111.1 in the second quarter of 2018 to 109.3 in the third quarter of 2018. The Business Roundtable CEO Economic Outlook Survey, conducted quarterly since the fourth quarter of 2002, provides a forward-looking view of the economy by Business Roundtable member CEOs. The survey is designed to provide a picture of the future direction of the U.S. economy by asking CEOs to report their company’s expectations for sales and plans for capital spending and hiring over the next six months. The data are used to create the Business Roundtable CEO Economic Outlook Index and sub-indices for sales, capex and hiring expectations. These indices are diffusion indices that range between -50 and 150 — where readings at 50 or above indicate an economic expansion, and readings below 50 indicate an economic contraction. A diffusion index is defined as the percentage of respondents who report that a measure will increase, minus the percentage who report that the measure will decrease.